Welcome back to the moors of Scotland and book three of the Guardians of Scotland series . Let me introduce you to Hawk and Kate . The chieftain of Helmfirth and a dragonkin warrior . A man burdened with secrets that keep him from falling in love, but makes him a fierce warrior . Until the day he is attacked and hurt badly . When h awakes he finds himself in Dunfermline abbey , he finds himself taking a young nun across the highlands as she tries to find herself . Sister Kate has demons of her own in her past . Growing up in the abbey after her mother abandoned her there as a child. Will they survive the trip across the highlands but better question will they survive each other and realize that their destinies are entwined . I loved the characters in this book . Hawk is a rough overbearing highlander , who is hotter then sin. His alpha male is out and proud , you don't know if you want to punch some sense into him or climb him like a monkey. But there is a sweet soft side that you see coming through . He loves his sisters with a passion and he loves his people. You see that coming through when he is with Kate. He is trying so hard not to let her in because of his dragon . As you read you see his gruff exterior start to crumble when it comes to Kate. Kate is a character that at the beginning you really feel for her, she has grown up cloistered in the Abbey . That is all she knows is Abbey life, but she is getting restless and wonders what is outside in the real world. As she leaves the abbey and starts her journey with Hawk, she starts to blossom. As you more into the story , you see Kate becoming a warrior in her own right . She grows and becomes stronger with each turn of the page . You can really connect with Kate and the trials she goes through to be the person that Hawk deserves . The rest of the dragonkin clan are also in this book as we see them come to the aid of Hawk and Kate . 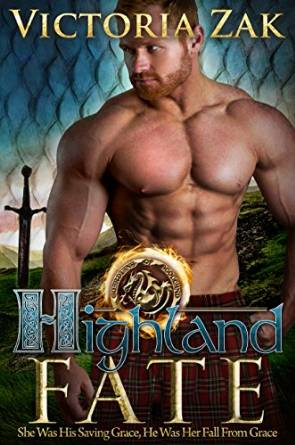 The author takes us on a voyage through the Highlands of Scotland with tough highlanders and the women they love . I have fallen in love with these books , the twists and turns that the author throws at us are some times gut wrenching or laugh out loud . I love the way the author entwines romance and adventure together oh yeah and don't forget all the sexual tension too . Trust me ladies you will want to know what goes on with Hawk and Kate . You will shed a few tears along the way but trust me it is so worth the journey . This could be read as a stand alone book but I strongly suggest that you read all the books in the series. They will transport you to a place where Dragons protect the sky and the women who love them are strong . Highlanders are my new favorite read and this author is my go to. Victoria weaves such magical tales . You should check them out , I guarantee that you will not be disappointed .